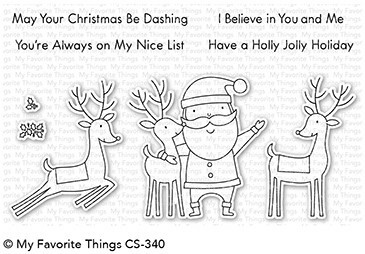 Stamps > My Favorite Things Clear Stamps: "Santa & Friends"
Santa wouldn't be where he is without the help of some very important friends. Celebrate Dasher and Dancer and Prancer and Vixen, Comet and Cupid and Donner and Blitzen (and don't forget Rudolph!) by stamping a team of essential reindeer companions for our cherished old elf. Also included are four coordinating greetings and holly accent images. Clear stamp sets include the name of the set on the sticker for easy identification. Our clear stamps and Die-namics are made in the USA.